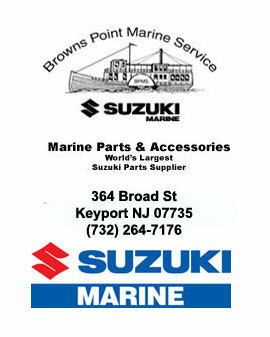 Browns Point Marine Service is located in Keyport, NJ and we are one of Suzuki's oldest and largest dealers in the U.S. We maintain the Largest Suzuki Outboard motor parts inventory in the country and offer parts and service for both retail and wholesale customers. Call us with your Model Number and Serial Number for the parts you need. We ship parts daily, across town or across the country. Our large inventory and FAST service makes us your best source for Suzuki Outboard Parts and Accessories. Since 1980 we have specialized in Suzuki Outboards and offer the best in sales and service making us the #1 Dealer in New Jersey. Suzuki has also awarded us their SUPER SERVICE AWARD and EXCEPTIONAL SERVICE PROMOTION AWARD for our outstanding customer service. Absolutely. We have taken every precaution to make your transactions secure. Our Internet site is built on a shopping cart software system that utilizes industry-standard security measures, including SSL (Secure Sockets Layer). All account information submitted to us is safely isolated from unauthorized Internet access. See our Privacy Statement. Sales tax will only apply to residents of New Jersey in which we are registered, but not to any other US state or the rest of the world. During the order process, you will be given a list of different shipping methods from which you can pick the one that suits you. The total cost of goods and the estimated cost of shipping as well as sales taxes if applicable are clearly displayed. A tracking number will be e-mailed to you when your order is shipped. You may return an item in its original condition for a refund or credit within 15 days of receiving. Shipping charges can only be refunded if the return is due to our error. All returns must be accompanied by the packing slip. After a return has been received, it will take 1-2 weeks to process. If using a credit card, refunds will be credited to your account. If paying by check or money order, a refund check will be mailed to you. We suggest using UPS for your protection. If an item you ordered is not in our stock, it will be ordered automatically. It will normally take about 1 to 3 days for us to receive these parts from one of the three Suzuki Parts Distribution Centers. For parts that Suzuki Marine is unable to fill due to back orders, we will update the Review Order page with an estimated shipping Date when available. If you have additional questions, please E-mail us or call our Customer Service Department at 732-264-7176. Also, we want to hear your thoughts and suggestions on how we can make our site more helpful for you. What about Warranties on parts and accessories? All parts and accessories come with a manufactures warranty. Click here for a copy of Suzuki's Warranty Policy.